New York (TADIAS) – Even if this is the most important American presidential election in the last half-century, why should Ethiopians burn with special interest in it? Considering what’s at stake for Ethiopian immigrants and their home country, the question warrants a fresh look. Let’s see how five central Obama commitments play out for Ethiopians in the U.S. and in ye-beyt agar (at home): 1) economic relief; 2) medical care; 3) energy development; 4) respect for law; and 5) dialogue with opponents. U.S. Economy. Obama promises an all-out effort to address needs of middle- and lower-income families. This means tax cuts for those earning under $250,000 a year; broad infrastructural improvements; fiscal reform; and trade policies to benefit American workers and increase the export of American goods. Such targets address needs of struggling first- and second-generation immigrants. He plans also to modernize school systems, add resources for poor school districts; double federal support for after school programs; provide grants for students seeking credits at community colleges; and invest $1 billion over five years in transitional jobs and career pathway programs. Ethiopia’s Economy. Aiding middle-class Americans financially helps Ethiopians find more funds to send home, a big source of revenues. Under Obama, Ethiopia will expectably receive more and smarter economic assistance, targeted toward development and not an endless blank check for food aid. His administration will commit to Millennium Development Goals, for cutting extreme poverty in half by 2015; and to strengthen the African Growth and Opportunity Act, to give African producers access the U.S. market and encourage American companies to invest on the Continent. Its approach encourages honest research on such issues, including whether or not collective land ownership benefits the poor. U.S. Health Care. The campaigns highlighted a huge and growing number of Americans who lack health insurance and the crippling effect of medical costs on family budgets. Ethiopian Americans suffer from this along with other American families. The Obama-Biden platform continues Obama’s core commitment to provide affordable, accessible health care for all Americans. For details click here. Health Care in Ethiopia. Apart from having so few trained health workers, Ethiopia has two vast areas of health care deficits: chronic food insecurity and epidemics. The first produces disease, stunted growth, and famine victims in the millions. The second concerns recurrent malaria, once thought wiped out; trachoma, now eliminable thanks to discoveries of a UCSF-based research team in Wolkite; and the ever-growing menace of AIDS. The economy is itself held back by so many undernourished and diseased workers. Energy in the U.S. Obama has long sought to rid U.S. of energy dependence on imported oil, for two reasons: security and environment. Instead he envisions a transformation brought by the utilizing free energy from wind, sun, water, and geothermal sources. This transforming initiative supports both goals above, by creating so many energy-related jobs and by reducing carbon emissions. Energy in Ethiopia. The cost and scarcity of energy and water resources that Ethiopia needs means that sustainable solutions are essential. What did not work in the 1990′s, when the World Bank offered ineffective renewable energy to Ethiopia, can work now because new technologies are cheaper and more efficient. A plan developed by a research unit called Quantum Green Technology shows how Ethiopia could have energy independence by 2012, through policies that let rural populations deploy their own renewable power and sell it to the EEPCo, and that create a carbon-free economy based on renewable technologies and ecologically sound and efficient management of resources. Rule of Law in the U.S. Setbacks under President Bush include dismissal of Justice employees for political reasons; illegal buying of News by Bush’s aides; illegal wiretapping; failures to enforce labor laws regarding minimum wage, overtime, child labor, and wage theft; and breaches both of the UN Charter and the US Constitution in the unilaterally invading Iraq. Obama has pledged to review all administrative directives issued by Bush in order to take action against any that violate the law. This manifests his statement that “I not only have read the Constitution, I have taught it, and I believe in it”–a statement readily endorsed by his many students over a dozen years at The University of Chicago Law School. Militant Foreign Policy in U.S. It was not by luck that Obama issued those prescient words about the futility of invading Iraq the year before it happened. He understood the complexities of the world and rather agreed with JFK: “We should never fear to negotiate.” As Nicholas Kristof wrote in the NYTimes two months ago, “the United States is hugely overinvesting in military tools and underinvesting in diplomatic tools.” Everything about the Obama candidacy promises to redress this imbalance. Militant Foreign Policy in Ethiopia. Ethiopia has not had a peaceful regime change for centuries. Although many of its local traditions manifest exemplary customs of civil discourse and mutual respect, and although traditions of shimgilena have been useful, for Emperor Haile Selassie and PM Meles Zenawi, who both effectively mediated conflicts between other countries, they could not prevail against historic dispositions to resort to arms to solve problems–first against Eritrea, then Somalia–or indeed so often against internal critics. I pray that these thoughts encourage all readers to make an extra special effort to see that Senator Obama wins on November–and wins big. Le-beyt agar’na le-wutch-agar etyopiyawiyan saybeju ayqerem!! Donald N. Levine served as the Peter B. Ritzma Professor of Sociology at the University of Chicago. His research and teaching interests focus on classical social theory, modernization theory, Ethiopian studies, conflict theory and aikido, and philosophies of liberal education. He is a colleague of Senator Barack Obama from their teaching days at the University of Chicago. It seems to me that of recent times, Dr. Levine, (though) a peace maker, has turned out to be a government supporter. We support Obama because we hope that he will help to bring a real democracy in Ethiopia and Africa, and not anymore false promises. Although all the reasons given by Dr. Levine are valid, there is atleast one more big [if not the most important] reason Ethiopian-Americans should vote for Senator Obama. That is, breaking the psychological barrier that a Black man can be anything he wants to be in America. This is not a reason peculiar only to Ethiopians, but to all people of African descent who through centuries of racism and idealogy of “racial supremacy” have come to think of themselves as either “inferior” or have learned to set their ambition lower because they believe that racism would not allow them to attain their goals. When the Senator tells us to have faith not just in him but in ourselves, it may sound like just a policy message to some. To some of us however, it is a deep psychological, social, and personal message that reenergizes our confidence. I know I speak for 99.9% of Ethiopians and Eritreans when I say he is one of us. We may have a Black man, first generation East-African-American (his father’s side), and an intelligent man to represent us and lead the rest of the United States as a President. What kind of reason could we possibly have to not vote for him? To vote for him is to put a down payment on our ambitions. He is our investment and our dreams. What more could we ask of this country at this time. There may be few more things, but for now, all we need to say is God Bless America, and go vote by being grateful that we can do things that we have been denied in our home countries. Barak Obama is half black and half white. He could have easily turned out with a lighter color and straighter hair….and still be the same person he is today. Please keep in mind that color is not as important as the person. Would Africans and African Americans support him as widely if he was not as ‘African-looking’ as he is? They should… if they have been looking at who he is, not what color he is. I think I understand the psychological, social, and personal impact that Eremias is referring to, but I don’t think that it should take precedence over the policies and message of Obama. Another reason to be involved in the Obama campaign was the benefit of the money and labor they spent to gather very important and sorely needed demographic information about the community. This info can be used to fight for city services to advertising and sponsorship events, etc. I think one needs to participate and exercise their democratic rights where they are, especially if they are proclaiming it for others elsewhere. Sincere thanks to Ato Tewbel for giving me a chance to refute in public some erronenous beliefs about my positions–and in the process to call attention to some ways in which many Ethiopians engage in political dicourse. I only hope that people who are hearing so many falsehoods about Sen. Obama can be equally alert. I shall resist the temptation to say “Ar ibakh tew inji” … and simply present a few facts. Facts: Levine has contributed in at least half a dozen ways: 1) winning support of congressmen for the enacted resolution of Shirley Jackson lee in the mid-1990s, which urged US support for Ethiopia to be tied to improvement in Human Rights conduct; 2) persuading several congressmen to sign the letter to PE Meles favoring the release of Dr. Taye Wolde Semayat, who was released ten days after that letter was sent; 3) providing information at State Department seminars about the curtailment of academic freedom and press freedom and human rights abuses by EPRDF; 4) working with chargée d’affaires Vicki Huddleston to promote efforts to secure the release of the Kaliti prisoners (who, following their actual release, requested Amb Yamamoto to organize a dinner at the Ambassador’s Residence in which they expressed appreciation for his efforts as the first shimagle to visit them in prsion and work toward their release; 5) issuing forthright critiques of the court procedures in the trial of the Kaliti prisoners, read by US officials as well as published in Addis Fortune (Click here and click here ); 6) providing an analysis of serious missed opportunities in Ethiopian national politics from 1960 to 2005 , studied by all US officials concerned with Ethiopia; and now 7) issuing statements critical of the proposed legislation curtailing NGOS in Ethiopia. In taking these positions, Dr. Levine has not hesitated to commend the regime on its several positive accomplishments–in the areas of building infrastructure, and mediating conflicts with other African countries, for example–when they seem warranted, and to support the PEPFAR initiative to combat AIDS. As I see it, this reaction reflects patterns of conduct that Ethiopians–especially those over, say, 45–evince among themselves: quickness to be suspicious, to neglect context, to feel betrayed, and to vilify those with whom they disagree. This pattern has appeared increasingly in American political discourse, and if you read The Audacity of Hope, by Barack Obama, you will find the pattern noted, analyzed, and discredited; and a call for a more open and mutually respectful type of civil discourse. Yet another reason for Ethiopians to go all out for Obama!! Barack Obama is certainly generating great enthusiasm among Ethiopians everywhere. We fear this tells us more about the disenfrachisement of Ethiopians by their leaders than about US elections per se. 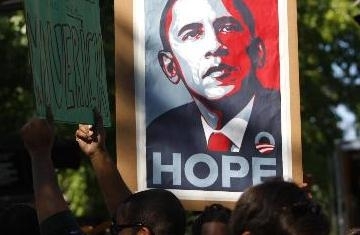 Obama is, therefore, a stop-gap in the current predicament. We also fear the presidency of Obama may in fact disappoint Ethiopians. For some reason US foreign policy since the reign of Emperor Haileselassie has consistently failed to uphold democratic aspirations of Ethiopians [mid-70s, late-80s, elections'05]. Also, a president Obama will be hamstrung, at least in the short term, by promises made to middle-class America, by global economic meltdown, and by a plan to remain in office for two terms. His vice-presidential nominee, Joe Biden, has already indicated the necessity of slashing down foreign aid to fulfill promises to domestic constituency. In the long term, Obama administration may be amenable to grassroots movements in Africa. That in turn takes hard work and a competent leadership on the part of Ethiopian opposition groups. The way things are, we see little hope for such a leadership to emerge. Intellectuals loyal to the ruling minority regime are working feverishly to disorient and misrepresent popular sentiments. Berhanu & Co. are fighting to remain relevant; Hailu Shawul & Co. are incoherent and undisciplined; Bertukan & Co. are ‘waiting for Godot’ to lend them some muscle against the ruling militia. We don’t believe a McCain presidency will be any different either. Would Ethiopian leaders be driven into the arms of the Chinese in a post-Bush administration?